So the original reason I created this blog was to write about writing fiction. Obviously, I've gotten a little away from that focus -- what with the squirrels and Christmas decorations and baby birds. Not only have I failed at writing fiction, I've failed at writing about writing fiction. Brad showed me this cartoon about muses the other day. It's funny because it's true. Alas, I have to be my own armed angry muse. (Which will be a real challenge, because as you well now, I only have two arms and nobody has sent me that prosthetic arm vest I requested a couple weeks ago). Anyway, I think I found away to solve my fiction writing problem. No, no, no, silly. I'm not making progress on my novel! But I thought of this fun idea to stretch my fiction muscles and maybe help me start hanging out in my right brain more often. I rarely throw out ticket stubs. Somehow I feel like I'll look back at them one day and they'll tell me a story about a part of my life that I'd long forgotten (I imagine my friend over at Papergreat would appreciate this). I have a bunch of them -- from concerts, movies, plane rides and other random adventures. Anyway, I thought I'd put my stub hoarding to good use for fiction writing and blogging. 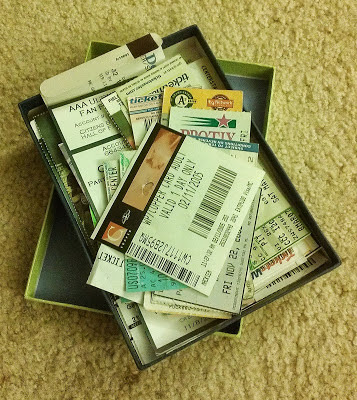 My plan is to pick a ticket stub and write a short story about it (like, 500 words-ish). To help spice up the enterprise, I'm going to use this random word generator to come up with two words to incorporate into each story. Despite the fact that all the events actually happened, the stories will be entirely fiction (well ... you know ... as fictional as fiction stories are ... which we all know in the end aren't necessarily fictional at all). The box was stifling this time of year. All those tourists in their thickest winter coats crammed in – a flock of squawking chickens in the world’s smallest coop. Walden was supposed to greet each of them – all bedraggled and laden with their NBC shopping bags and backpacks and cameras and the holiday spirit the insufferable city stuffed down their gullets. On the 70-story ride up he was supposed to share about history of the building – its Art Deco design, the famous news anchors who’d ridden that very same elevator car, the damn tree. His enthusiasm waned with each day and each ride. He’d been on the job nine months and hadn’t bothered to dry clean the burgundy sports coat they were all forced to wear. His boss had mentioned the coffee stain on the lapel more than once, but Walden knew her real concern was the smell. He didn’t much care though. Elevator operator – excuse me – guest transportation coordinator -- was not a long-term plan. For one, he was claustrophobic. And then there was the problem of humanity en masse and that it actually made him empathize with Ted Kaczinsky. Just a little bit. But as it turns out, it was really difficult to find work as a topiary sculptor – even in a city that specialized in unique career opportunities. He’d come to work hungover and sullen. The first ride up was misery and the subsequent 25 left him walking a razor wire between rage and homicidal rage. On the 26th trip a woman hair that would make Diane Ross envious stood in front of him gabbing her phone. And as more people squeezed in the car she pressed back into him. Each time he breathed in her hair got sucked into his nose. And then a kid threw a tantrum because he was exhausted and ravenous and didn’t care about panoramic views of city. His fit sent a wave of passengers leaning toward Walden, who was in the middle of his spiel about the elevator speeds (never fast enough) when the woman with the giant hair fell back into him delivering a wad of thick, coarse hair into his mouth. He gagged. When he got her spit-covered mane out of his mouth, he made a decision. He pulled the pair of pruning shears he’d carried in his back pocket since he was mugged and began snipping. At first just the clump he’d been forced to chew on. When nobody noticed (he continued talking about how the shape of the observation deck resembled a ship) he clipped some larger clumps. By the time they’d reached their destination, a pile of hair lay at his feet – the back of the woman’s head had been shaped into a large phallus. Walden admired his work -- enjoying his job for the first time ever. As the passengers exited the car the only one who noticed his sculpture was the angry kid, whose eyes bugged out of his head. Walden glanced at him and winked and put a finger to his mouth. The kid grinned – happy to be in on the conspiracy. Walden kicked the hair out of the car, put the shears back in his pocket and pressed the down button.